One of the food items I was most surprised to read as a suggestion for baby's first food was avocado. I haven't seen jarred avocado in the baby food aisle and have never seen another baby eat one so it was quite a surprise. But according to all the information I read, it is a great first introduction food because it is easy on the baby's stomach and doesn't tend to cause any type of adverse reactions. I was also really excited to put it in Rex's rotation because both Forrest and I are avocado junkies (we even visited an avocado farm during a vacation to Central California and posed with the trees for pictures as if they were celebrities) and I thought it would be cool for him to indulge when we do. Well unfortunately Rex hated the fatty fruit. He acted as if we were putting chunks of poison in his mouth and he gagged and coughed violently until we got the message and stopped shoveling the green goopey spoonfuls into his mouth. We were disappointed to say the least. How could he not take to our beloved avocado? We still aren't sure, but we do know he wasn't as excited to be eating it as we were to be serving it to him. We will try again though since we aren't willing to accept the fact just yet that he doesn't share our avocado affinity. It wasn't all disappointment though in the avocado department that evening, because there was one positive outcome. Although Rex didn't like his portion, we certainly did. Below is the recipe we made with our avocados that night and it was sinfully indulgent! The dressing doesn't seem like much while you are making it especially since it is made up of mostly water, but it is perfection. And paired with the mono-seeded fruit, it is divine! 1. Cook bacon in a large frying pan over medium-low heat until crisp. Drain on paper towels; let cool. Remove pan from heat and discard all but 2 tbsp. bacon fat. Divide avocado wedges among 4 plates. 2. Heat reserved bacon fat over medium heat. Add garlic, 1/4 cup water, the lemon juice, and sugar and simmer 1 minute, stirring. Immediately pour over avocado wedges and serve. oh wow, I HAVE to try this! Hubby and I are both also avocado junkies. Our daughter did have it for her first food. If you're ever looking for really good ones, every single one we've ever gotten from Sam's Club has been wonderful. Elizabeth (Bizzy as she is called by our family) made this appetizer at my house to accompany the fish from my son's school's fish fry and it is to die for! A restaurant quality dish ... something you will keep talking about long after you have finished eating it. This dish goes on the Top 5 list of the blog. I licked the frying pan before washing it after dinner. If you like avocados or bacon, this will be your new favorite dish. oh gee...I'm so hungry right now. 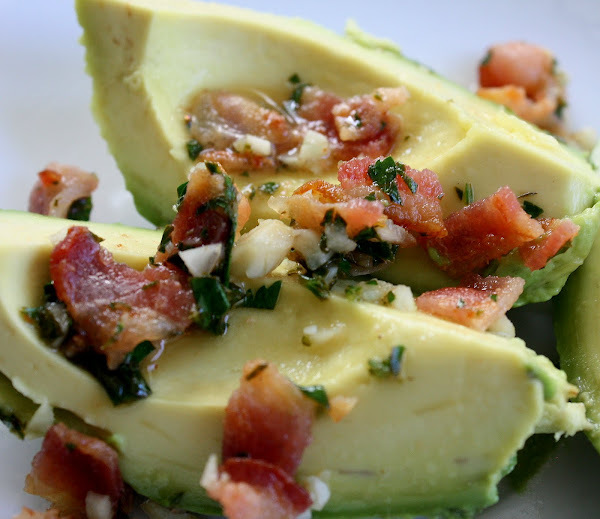 Gilding the avocado with bacon is such a great idea! Salty fat on creamy fat! mmmm! fantastic! i love avocado, this looks so good, especially with bacon! Anytime avocado and bacon get together, it's good! We live on an avocado farm in N. San Diego county. All four of our babies loved avocados, and still do (they're in their 20's now.) Avocado is a superfood. More information about our avocado ranch: http://www.CaliforniaAvocadosDirect. I'm so glad I stumbled across your blog! As a Louisiana native, now living in Colorado, I have added almost every New Orleans recipe to my "must cook" list! Can't wait to try so many of your recipes and bring a taste of home to Colorado. I LOVE avocados! I was really surprised when my 7 month old loved them. :-) I'll have to try this! To Take-Out or Not To Take-Out?